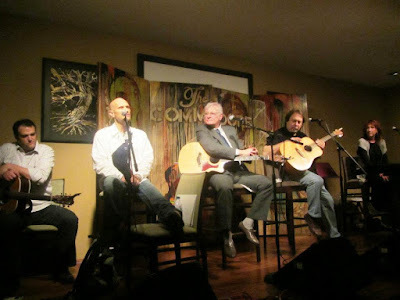 Kevin Sharp, Jerry Foster, Jim McBride and me at what would be one of Kevin's last. Songwriter rounds - aka performing 'in the round' - probably originated here in Nashville, Tennessee. This city is widely considered the songwriting capital of the world, and these acoustic showcases of original music are certainly on every nook and corner within 100 miles of our famed Music Row. But they are also taking place now all over the US and internationally. There's a televised one I recently watched on PBS called "The Transcontenental Sessions" which was really thrilling. The format of a songwriter round calls for performers to set up on stage together. They all do one song each, then yield to the next person. They repeat the cycle for another round of songs until the allotted time is up. This is different from the multi-artist events where a singer/songwriter goes onstage alone and does all their songs consecutively, then leaves the stage to the next performer. The reason for these rounds is primarily to promote and demonstrate the songs. Songs get discovered and recorded from these exposures. Also, artists have been discovered from these kinds of performances. And a third reason for doing these kinds of shows is that singer/songwriters can have artistically high moments playing their songs within a small circle of others whose music both contrasts and complements each other, in intimate settings before audiences who are there to actually listen. The audience is there to hear music, not a speech. Imagine this scenario: A songwriter keeps unrolling their personal story in spite of the fact that no one is listening... and like a huge speed-bump stalls the momentum of the show out. Talk about too much information! The audience is over the song before it begins. You need to earn the right to talk onstage! Consider not saying anything other than a quick 'hello' and your name... before your first song. After proving yourself with a good tune, yes, it can be very effective, compelling and entertaining to spin concise tales of how some songs came to be. And if you can say something to make folks laugh, feel comfortable and part of the interaction, great! But feel your audience out; sense how people are responding, note how long the performer before you talked, ask yourself what you think the audience would love to hear from you about when choosing when and how much to talk. Instead of a long-winded diatribe, cut to the chase. If in doubt, leave it out! I was at a songwriter round not long ago where a clueless performer started passionately singing as loud as he could, desperately trying to get the audience's attention and maybe a standing ovation. During his first song, the whole front table emptied out! If you sing too soft and breathy you are not usually in delivery mode, you're in rehearsal mode. Your voice's resonance is thin and uninteresting. Not very effective at getting people to listen. If you're too loud, you might as well yell at the audience. Don't use the volume in a small setting that you would in an amphitheater. Remember that venue size matters! Worst of all don't sing too soft and too loud! Pitty the poor person sitting in front of your speakers, leaning in to hear your quiet verse only to be blasted by the volume on your high chorus! If you don't know how to control your voice, learn! The best rounds I've ever performed in or sat through have been ones that felt like unique, magically connective and musically excellent events. The one pictured at the top of this post with Kevin Sharp was a round filled with magic, and now a great memory with Kevin, who passed away in 2014. Years ago I enjoyed making magic with a recurring foursome at the Bluebird Cafe with Marc Beeson, JD Martin, Thomas Cain and myself. I learned so much from them. The friendship, musicality and audience response made these rounds a very special memory for me and I hope for the audience, too. Songwriter rounds are by definition exercises in social interaction. You should connect not only with your audience, but also with the other performers in the round with you. Look at them; let them into your performance equation... interact with them! Sometimes you know these people, sometimes you've never met before. You need to bring out all your social graces and turn them into instant friends whose world you've made a little brighter in some way. Speaking of graces... I don't care how good your songs are, if you are negative, stingy, overtly competitive or ungrateful I'm not going to be receptive to you or your music. I've been to rounds where performers barely acknowledge each other's presence. Sitting so close to people you ignore is uncomfortable.. and uncomfortable to watch! Smile, interact when it's natural to do so, listen attentively and support them when it's their turn. Listen to others like you'd have them listen to you. So I'm sitting at this songwriter round, and instead of getting wrapped up in the amazing songs, I find my car keys have jumped out of my purse and are now jingling between my fingers. Argh. Leave them wanting more... not less! When considering how long to sing, factor in how long you'll probably talk plus a little on-stage interaction. I usually figure an average of 4 or 5 minutes per song. A typical 2 hour round with 4 songwriters usually calls for 6 or 7 songs each. Take into consideration how long the audience has had to sit through, especially in a multi-artist, multiple round event. If someone before you goes long, consider dropping some of your set to get things running on time. Odds are you will be the one who gets a better time slot from a grateful event organizer next time, and of course it's great when the audience wishes you would do one more! Doing a songwriter round can be like cooking a great meal. Even presenting the right thing at the wrong time can ruin the magic. Choose your material wisely, and have optional songs ready to perform if a pivot is necessary! Consider the venue and the nature or theme of the event when deciding on your tempos and lyrical content. When playing in-the-round, consider the songs sung before your turn. Too many depressing ballads, angry revenge tomes, preachy messages or sad failed relationship dirges will repel your audience. So will inappropriate lyrics at family-friendly events. Be prepared to switch your songs if necessary. As for your biggest hit or best song, schedule it for last but if the round seems to be lagging behind, consider deleting another song so you are sure to end with the most important one. In fact, it is absolutely proper to ask if the next round is the last one. Bonus mistake... Not telling them who you are! If you're trying to build an audience, it's rather useless to perform a great round and leaving people wondering who you are and where they might find your music! This happens all the time... in fact, at one of the best rounds I've heard lately I didn't get the name of a wonderful new singer/songwriter I who interested me... and I was sitting in the front row! Make very sure you say your name and website where people can find you online. Do it slowly and clearly enough so people understand you! And say your name again at the end of your round. You know, even if you pack the house with your family and friends, you want more than polite support and unearned applause. Apply these tips to your next round and you may find that a lot more people than your sweet mama will be so glad they came! My 6-cd Power, Path and Performance vocal training course has lots more to help you with your live performances, along with all other vocal issues. Check it out here. Or contact me for a lesson! Music is also soul when you listen closing eyes then It plays around your whole body.